In this page, links were given that will help you find some useful resources and books. These resources will probably help you with your CEED exam preparation; for entrance to Masters in Design (M.Des) in India. Remember CEED Part A is similar to UCEED exam and in fact difficulty level of UCEED is much higher than CEED exam. So, I have also included questions, practice mock tests as well as materials from UCEED page for your study. Hope you find them useful. Like and follow stuff you look on Facebook to get updated with new resources. firstly, I want to thank you for all the resources. I found the perspective drawing book especially helpful. Secondly, can you please direct me to a book, which will help learn drawing people and animals, right from the beginning? I am not good at drawing, and a step by step instruction guide would be very much helpful. Also, is there a good ebook, to learn shading from? The book you have suggested in the Resource section does have some good tips but as a beginner, it is a little difficult for me to comprehend all of it right away. So if you can suggest something for beginners (hopefully, if it builds up like it does in that perspective drawing ebook), it would be great!! Thanks a ton for taking the effort to put all this up...it's a great one-stop shop for my prep! Thanks for your comment. Thanks again for bringing some facts. Yes, I have to post more about beginners sketching practice. For now, please go through the following links. I will try to give more similar topics in the coming days. If you don't find these links useful, then revert back. I hv seen previous year papaer of ceed in which question of product design , visual communication and UID were asked in optionally. So do i need to prepare for three of them or if im good in any one stream so i should improve it only . These are some quick topics that you can concentrate for now. If time permits, I would also try to give a detailed description or so called proceedure to deal with uCEED along with the resources like I did for CEED. Hope this helps and I would recommend you to explore the Part A resources and as well as the topics in this page for your initial knowledge, that should give you some idea. And yes please check yourself whether you are really interested in design career and have minimum design passion/skills ! plz upload material for UCEED as soon as possible.i will be thankful to you. Stuck with exams Rakesh! will upload something ASAP. How should i start my preparation for ceed 2015? What are the things i have to learn, what should be my priorities? 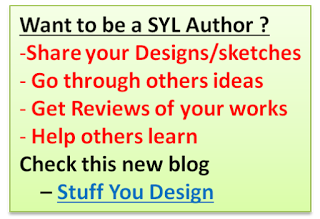 Not all, but I have included some collections of book writers and directors, please check part A resource page. Thank you very much for sharing info with everyone. I already came across that site many times. Great stuff for design students, but I doubt the stuff is too design specific in the sense it's very good to learn about different design streams, but might be little helpful from exam point of view. May be it could be of much help after ceed i.e start of portfolio process. Sir could you suggest something for NID (PG) entrance exam? I don't hve much expertise dealing with NID, sorry! where can i found questions related to unfolded view of objects? take any solid/geo questions, and try to solve them for unfolding. Anyway i'm alredy getting searching for those ques. My daughter is giving UCEED 2017. She is in 11th std. How to start with your blog for preparing the entrance exam. If you could post some schedule for the new beginners, it will be of great help. (If we start with first link it is leading to numerous links, we don't know what is enough). So please provide with a guide time table for 2017 aspirants. UCEED and CEED covers numerous topics and so obviously it is required to include these many link. Expecting a single guide book some set of topic is useless for this kind of exam. Anyway, after 2016 UCEED and NID exams gets over, I will consider making a timetable with proper topics to be covered. Yes sir, I tried to cover all the resources that I can gather for the exam and I will be improvising this blog according to the syllabi changes or pattern of every year. Regarding timetable, I thought it's not that practical to give a common time schedule especially when time for preparation is more than 1 month. The reason is: every individual have their own daily commitments and each prefer different times for different choices, like some prefer to start GA at the very beginning while some don't, some are students whhile some are at home. That's why I thought common time table might not suit to everyone's choice/taste. Anyway, since you want it badly, let me see if I can give some schedule to your daughter, again please note that without knowledge of some basic facts like what is she doing (like studying regularly or weekly). Any exams etc I cannot give proper approach, if you can please drop the details and the time that she can spare in a week or so. I will try to figure out some schedule soon. Please drop the details to my/SYL FB messages or mail me. Thanks for your immediate reply Mr. Bhanu Chander. I fully agree with you. I will be sending the details of her plan to utilise the time for board and uceed exams, through your SYL/FB inbox. Please inform me how she has to plan her study schedule. Once again I appreciate your commitment and dedication inspite of your regular studies. God bless you. Thanks a lot for these resources sir. And please can you compile a list for indian musical instruments also? I think you haven't checked this page properly! It's there in this page itself, pl chk above! The following question has been appeared for NID DAT 2016 for 10 marks. How to solve such type of questions. 1.A Glass that is half filled goes in search of water to fill itself. 3.A little girl meets a lioness who is lost trying to find her way out of the intimidating city. Choose any one scenario and write down three challages that the first character might face and also write solutions for each of three challages in the space provided.